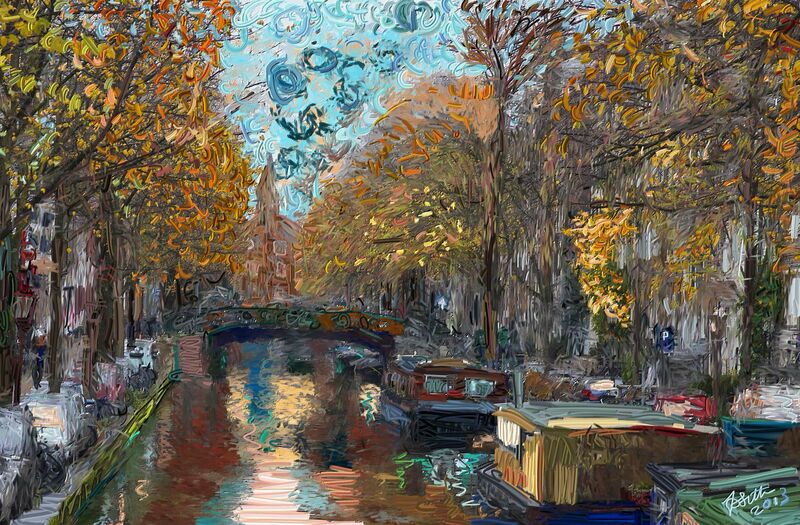 This painting was created as part of a tutorial titles “Thick Paint: Inspired by Van Gogh” which you’ll find in the Painter X3 In-Depth section on this site. I love the vistas in Amsterdam as you look down the canals at the bustling life where bicycles, house boats, tall houses and, at this time of the year, beautiful golden leaves, all vie for attention! Another painting also inspired by my recent visit to Amsterdam is “Looking Out”. A great painting of the city I was born in. I love the colours and reflections on the water.